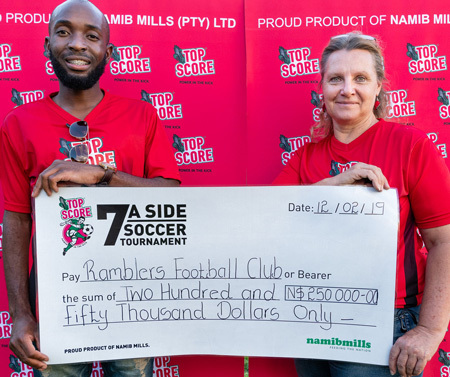 Namib Mills launched its 7-A-Side Top Score Soccer tournament this week at the Ramblers Soccer Stadium. The event which is in its 19th year is the oldest and largest social sports soccer tournaments currently in the country. Senior Brand Manager at Namib Mills, Marne Bouwer at the launch said this year a total of 77 teams entered the tournament and prize money includes N$16000 for the winning team, N$8000 for the second runner up, N$6500 for third place and N$2500 for fourth place. According to Bouwer, said the total investment of this tournament is valued at N$250,000 and also included is a floating trophy, gold, silver and bronze medals for the top three winning teams. Entrance for the event will be free and the games will take place every weekend from Friday from 18:00 till late and Saturday’s from 14:00 till late. The sponsors encouraged fans and supporters to bring their camping chairs and come support their favourite teams as they compete for this prestigious title. Bouwer said as a company they are committed to Namibia, therefore this sport initiative aids the company in investing in a vital staple in the development of the country. “A trophy carries dust but memories last forever so we want to encourage each and every team to not only give their best in the tournament that lies ahead, but also to enjoy this opportunity to be in the company of fellow soccer sports lovers who continue to show support, dedication and passion towards the game and the Top Score 7-A-Side Tournament,” she added. 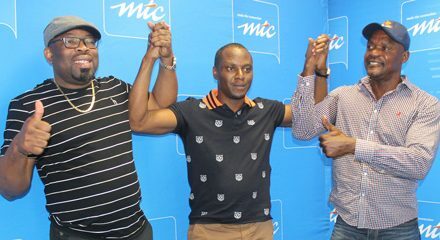 Caption: from left to right, Shawapala Kandjabanga, Junior Brand Manager for Top Score and Cynthea from Ramblers Sports Club.